2" 2.5" 3" 3.5" 4"
3 Inch Custom Circle Labels - Repositionable White Shiny Lamination Paper are perfect choices for bringing a special look to mint tins, jars and spice containers. 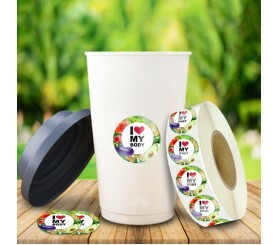 Customizing artisan products or branding promotional gifts can be made easier with these custom labels. Made from Indoor White Paper, these custom circle labels are featuring repositionable adhesive and a shiny finish for extra visual impact too. Order these labels right now to gain free custom design, free online proofs and shipping offers. Request a quote to know the value savings that you can avail on bulk orders of 3 Inch Custom Circle Labels - Repositionable White Shiny Lamination Paper.